I have to say I have mixed feelings about this one. If I hadn’t been reading for the purpose of giving out a review I can’t say I would have finished it. I tend to be more of a plot driven rather than character driven kind of reader and this isn’t really a plot driven novel. About a third of the way through I’m getting irritated thinking ‘where is this all leading?’ But then something odd happens and I find myself getting caught up in this young boy’s life and first love. I think I would’ve still preferred to have some kind of plot to follow, but it wasn’t bad, that is if you can get through all the Beatle talk. I feel this could have been cut down by at least half, but that’s me. If you are a Beatle fan then you’ll probably love it. Bottom line, if you’re looking for something deep and thought provoking, this isn’t it. If you want a light read to make you remember what first love was all about, you’ll probably enjoy it. 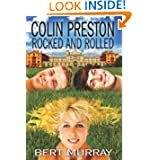 I found Colin Preston Rocked and Rolled by Bert Murray started out slow, but then slowly began to wiggle its way into my heart, hooking me by the end. By the ¾ mark I had to find out what Colin would end up doing. The writing is good, better than a lot of novels I’ve read. I’d love to read something with a little more depth in the future by Bert Murray. Posted by Denna Holm on July 7, 2011 in Archives. I love reading and writing about fantasy and science fiction.